I may have climbed on my soapbox about rising alcohol levels but that doesn’t mean I’m a stranger to wines with fuller figures. I’ve even dabbled with a size 15% recently. I really, really wanted to feel the same for Some Young Punks‘ Passion Has Red Lips. I love the 50’s pulp fiction labels. I love the Aussie company’s attitude and approach. I just didn’t feel as strongly for the wine itself. Don’t get me wrong, I didn’t dislike it. I just found this Shiraz and Cabernet blend very full on, even though it was lower in alcohol than the Amarone. It tipped me over the edge into a teeny little hangover. We had some neighbours over for dinner and we’d already downed some fizz and an elegant Pinot Noir. We all fancied another glass, and I was dying to try Passion. But it was like being smacked by a fruit and alcohol right between the eyes. We finished it the next day with some aged steak and the fruitiness was a good match to the meat. The saddest part for me though was not draining the bottle, but throwing the lovely label away. 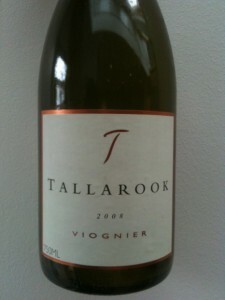 Much more to my liking was the Tallarook Viognier 2008, which I’d sampled at a tasting organised by Find Wine (who also stock Passion Has Red Lips). On the nose I could smell peaches, butter, vanilla and a hint of Kiwi fruit. On the palate, it was like honey had been drenched over the peaches. Some people find Viognier (especially from Australia) can be oily, but I thought this had a nice clean current running under the buttery, peachy juices. 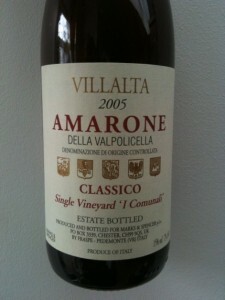 It was voluptuous without being blowsy and – as I tweeted rather pompously just after drinking – very satisfying. 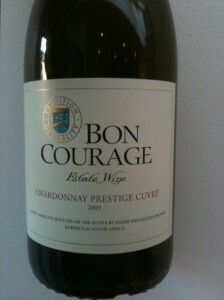 Finally, in my round up of big beauties, is this South African lovely, Bon Courage Chardonnay Prestige Cuvee 2009. It reminded me of ripe pears cooked in lemon zest and vanilla, with some hazelnuts sprinkled on top and perhaps a dollop of mascarpone. A little bit on stonefruit in there too. I do think South Africa is producing Chardonnays that can rival Burgundies from the Cote D’Or and they are a lot more restrained than many of their Californian counterparts. This is a good example. Lots of different decent flavours and not too heavy on the oaking. Retailing for around £9, this is great value for the quality you are getting.